Butterworks Farm is one of Vermont’s oldest certified organic dairy farms, and has a strong reputation for growing some of the finest organic grains in the state. 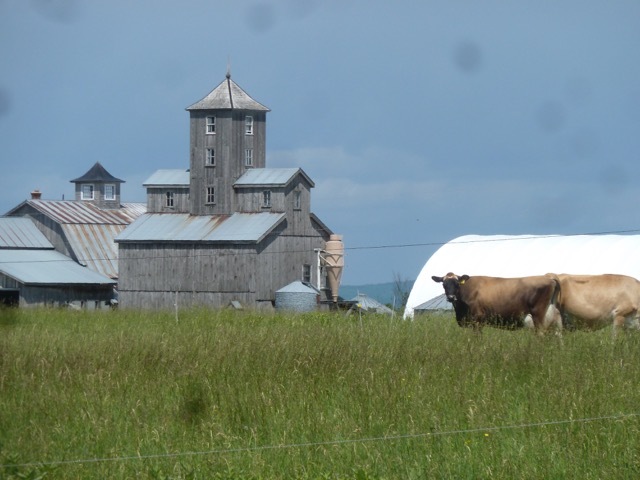 The farm building complex and surrounding fields are situated on gently sloping fields near the border of Canada. A herd of Jersey cows produces milk which is processed on site into yogurt, kefir and rich Jersey cream for direct and wholesale markets. Butterworks Farm leases and owns additional parcels in the surrounding area, including some floodplain fields. The farm has grown a diversity of whole and milled grains for regional markets, and animal feed and is currently transitioning to a 100% grassfed operation with a bedded pack system. Alissa White visited Butterworks in early April 2017 to talk to Jack Lazor about how he manages his production with the impacts of climate change in mind. Regional climate change projections predict agriculture in the northeastern US will experience a variety of direct weather impacts, and indirect impacts as a result of climate change. For Butterworks Farm in northern Vermont, the site-specific vulnerabilities of climate change encompass potentially both direct and indirect climate change impacts. Pressure from pathogens and parasites of livestock. Jack and his family balance many goals and challenges when making decisions about managing their farm. 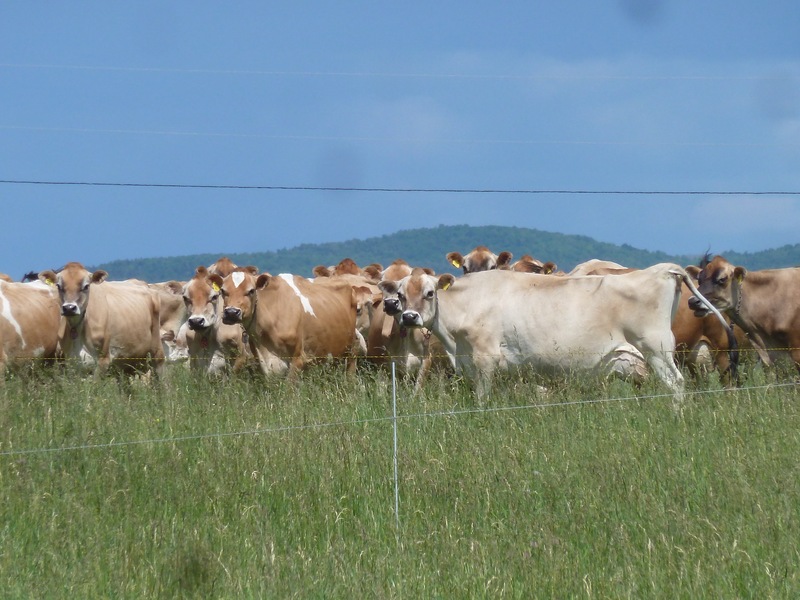 Climate concerns fall into both short and long-term decision making at Butterworks, but at the forefront of farm decision making for their family at this time are long-term financial solvency and near-term intergenerational transfer of ownership. Climate change considerations are important, but auxillary to day-to-day management and long-term planning. How do we manage climate change and weather-related risks at the field scale? Jack implements a number of practices on the field, specifically, managing for flooding and controlling soil erosion. He has transitioned land which is particularly prone to flooding from grain production into permanent forage. “We’ve been farming this floodplain property for 20 years…Increased incidence of high water… could come any month of the year now… Then we only loose one cut out of three if there’s high water.” In previous years, the farm has used underseeding cover crops to limit erosion from high intensity rain events. Jack attributes many benefits to crop rotations, including some that are directly associated with climate risks. His goal is to do less with tillage in all fields because he sees evidence of better soil quality and healthier plants without tillage. By minimizing tillage and keeping roots in the ground, he maintains soil health with organic matter of 8-9%. At the field scale, Jack is focused on increasing soil health to buffer the impacts of drought, flooding and extreme precipitation. Cover crops are planted to help hold soil from erosive forces, and land which is particularly flood prone is being transitioned into perennial forages to protect soil. Building soil biological health and organic matter levels has multiple benefits for the farm. Jack sees the soil health reflected in the plant growth, and in turn the health of his farm’s Jersey cows. Increased organic matter limits the damage of extreme precipitation and holds moisture in times of drought. In response to 2016 summer drought, Jack relied upon increasing his land base for forages and maintaining good rotational grazing practices. In contrast, grain production has been challenging financially as it’s prone to disease during wet summers and storm events. Overall, the farm’s trajectory is towards perennial forages and away from grain production. 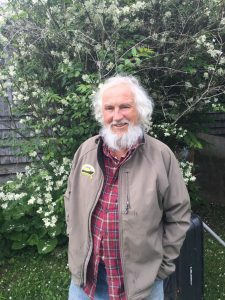 Farming for over 30 years in Shoreham, Will and Judy Stevens have noticed climate changes at their organic farm – Golden Russet Farm. From 1985 to 1995, Will recalls having a number of late frosts in May and that the first frost date typically occurred in early September. However, in the last 20 years, there’ve been only two years where the frost date has been as early as that, with the typical frost date extending to October. Our growing season is longer and we have more frost-free days; we’ve had years where we’ve had no May frosts and more notably the fall has gotten longer. I’ll take a dry year over a wet year any day. It’s easier to manage dry conditions with irrigation than to be at the mercy of heavy rain events. We’ve noticed over the years that almost every rain event is a violent event. We used to get gentle rain. Now it’s thunderstorms and violent events. With 2.5 inches of rain in an hour, we needed to get rid of the surface water as we didn’t want standing water. In 2012, working with their existing equipment (a three-bottom moldboard plow), the Stevens built up raised beds by alternating plow passes with 12 inch dead furrows. This roughly formed 36 inch wide ‘beds’. Going to this type of raised bed did add some complications. After soil smoothing and mulching, the Stevens ended up with a final bed width of 30 inches, but this width was too narrow for the transplanter and cultivators as they risked sliding off the beds. 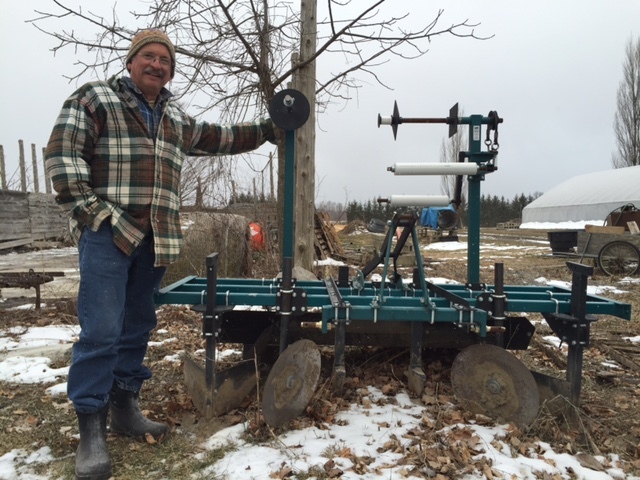 After several years making adjustments, the Stevens invested in a three-point hitch bed shaper in 2015, which can be pulled with their tractor to shape 34-inch beds, moving soil up from the wheel track, so that only two passes need to be made with the press pans. The 34 inch top width of the beds matches up with the cultivator and transplanter. At the same time, drip irrigation tubing is put into place as the beds are made. The Stevens started by planting carrots, lettuce, beets, and spinach in some of the raised beds, and brassicas, broccoli and corn in others. In 2016, the Stevens had 12 raised beds of tomatoes, cucumbers, melons, peppers, flowers, and 11 raised beds of garlic across their 1.5 acre field. With the bed shaper, there’s no need to till the topsoil. 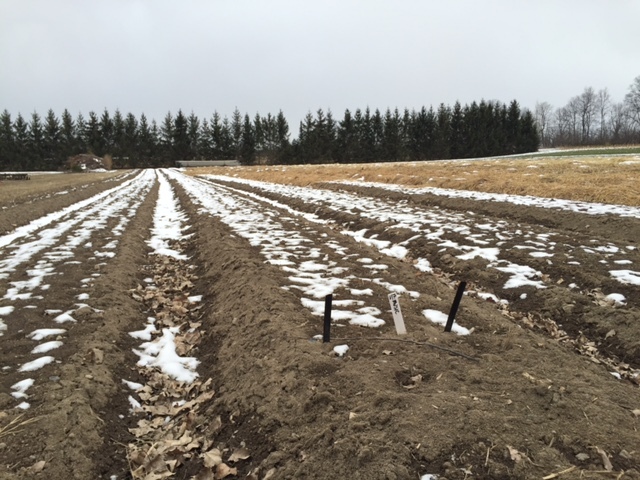 In fall 2016, the Stevens bought a chisel plow with four shanks for subsoiling as their soils have a plow pan, which needs to be broken up to make the soils more friable and further improve drainage. For 2017, their plan is to increase by a third the raised bed production area so that they’ll have two acres of raised beds in 2017, and then, they’ll expand to three acres by 2018. With raised beds, Golden Russet flower sales are up 50% from 2015 to 2016. Soil temperature changes more quickly on raised beds with greater surface area exposed to air. These equipment purchases of $5,800 represent only 17% of the cost of the Golden Russet losses in the year of Irene, 2011. Looked at another way, this $5,800 spent in 2015 was easily recouped the next year with the $7,000 annual increase in flower sales. While Golden Russet’s overall use and related costs of irrigation are up, it’s clear that the combination of irrigation to increase yields during dry periods and raised beds to prevent losses during wet periods will result in more stable revenues over the years. A $5800 investment in equipment for raised beds was easily recouped in one year of increased revenues. Suzy Hodgson visited Will and Judy’s farm in February 2017. 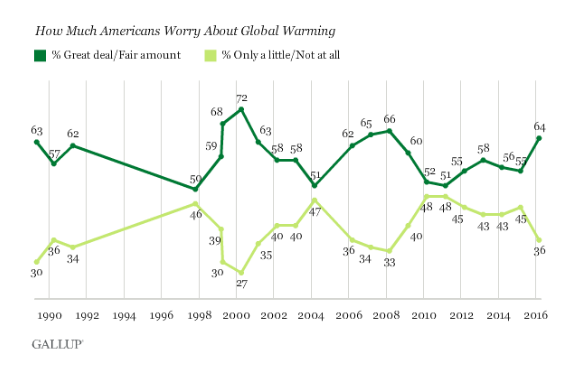 While political discourse hit new lows this past year, concern for climate change hit an eight year high in 2016. Whatever headwinds affect legislation in the new year, a number of localities, states, and organizations are taking action. Already, 165+ jurisdictions have signed or endorsed the Under2 MOU. Together, this group including Vermont and our neighboring states, New York, Massachusetts, New Hampshire, 7 other states and five Canadian provinces among others, represents more than 1.08 billion people and $25.7 trillion in GDP, equivalent to more than a third of the global economy. This global compact among cities, states and provinces aims to limit the increase in global average temperature to below two degrees Celsius. The Under 2 MOU calls for parties to aim to increase energy efficiency and develop renewable energy and to collaborate on climate change adaption and resilience efforts, scientific assessments, communication and public participation. It is in this spirit of collaboration, communication, and adaption that UVM Extension Center for Sustainable Agriculture partnered with the USDA Northeast Climate Hub produced three videos showing Northeast farmers talking about their farms and how they’re experiencing climate change and are adapting with cropping strategies, water management and soil protection practices which mitigate climate impacts and help them farm successfully. 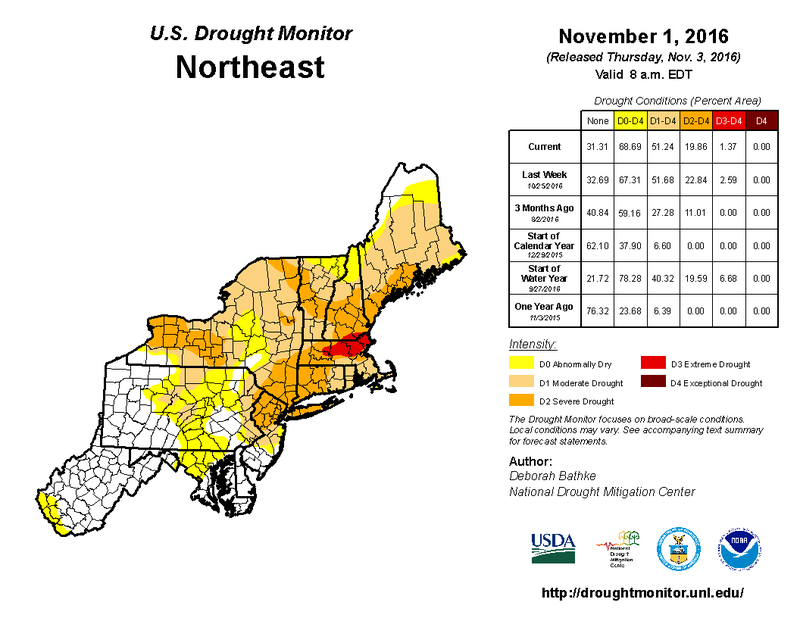 This past fall, 51.2 percent of the Northeast experienced moderate to exceptional drought, the largest extent since 2002 in the 17-year USDM record. Vermont was 3.5 F degrees warmer than its 20th century average, and this past year was the 2nd warmest year on record. period. This past fall was drier than on average, 2.38 inches less rain that the 20th century average. In Vermont, Andy Jones, Manager, Intervale Community Farm in Burlington, VT explains how he uses irrigation to maintain soil moisture. Andy talks about his strategies in managing water, whether too much as in the summer of Tropical Storm Irene in 2011 or not enough as in this past summer 2016. Andy shares his thoughts on seeding rates and timing for the cover crops which protect the Intervale’s’s soils and shows the equipment he uses. In New Hampshire, Pooh Sprague of Edgewater Farm, explains that even though his farm location is within feet of the Connecticut River, in dry periods, there’s no guarantee that he’ll be able to access enough water for this crops. 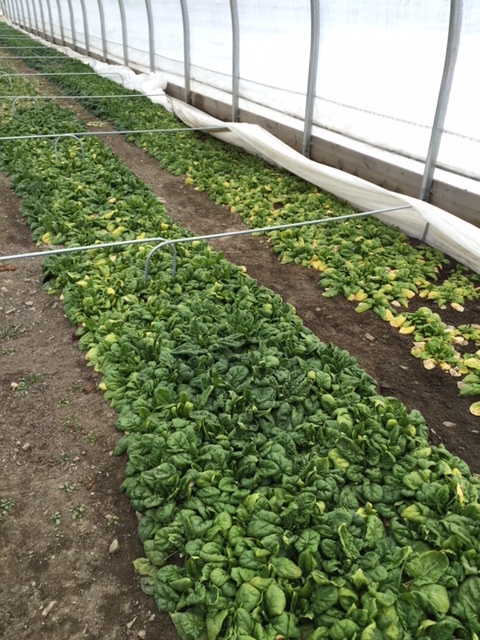 With increasingly erratic weather in the CT river valley, Poo has increased his use of hoop houses to protect his crops and extend the growing season. Farms aren’t built in a single person’s lifetime. Farmers throughout the northeast are experiencing the effects of extreme weather due to climate change and are managing their farms with the resources they can find. It’s at this community level that the Intervale Community, Edgewater, and Upinngill farms are doing their bit to adapt to the new normal of climate change. This week’s scattered showers are not enough to bring relief to the sustained dry summer we’re having in Vermont. Not suprisingly, the degree to which farmers and their crops are affected depends on their access to water and their irrigation systems. In general, Champlain Valley farmers may be faring better than their neighbors in the Pioneer Valley, Masssachusetts. While Vermont is experiencing abnormally dry weather, much of Massachusetts is facing severe drought conditions. Moreover, Vermont farms that have invested in irrigation systems are reaping the benefits of this prolonged warm, sunny weather balanced by regular irrigation. With normal precipitation levels in Vermont at less than three quarters of their normal amounts, maintaining soil moisture is challenging but farms with healthy soils paired with an irrigation system are well positioned for this stretch of unusually dry weather. In Burlington, Vermont, the Intervale Community Farm (ICF) started building its irrigation system 20 years ago. We’re fortunate for being in the floodplain that we have abundant water supply with a main stem river and also some large high capacity wells in the floodplain – it has made us a much more resilient farm as we can contend with dry periods by using a mix of sprinkler and drip irrigation,” says Andy Jones, ICF’s farm manager. Summers are hotter, the highs are higher, the existing soil moisture evaporates, and the plants transpire it more. 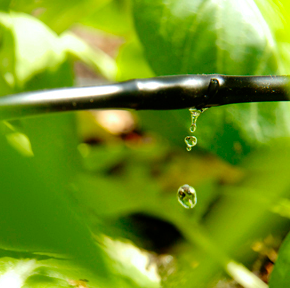 We use drip irrigation where we have plants that don’t want water on the leaves or that are spaced far apart so we can get some real weed control benefits and some water efficiency benefits by not watering the whole area. For winter squash, melons, cucumbers, sweet potatoes, peppers, we use sprinklers and for almost everything else, drip irrigation. Andy describes that ICF’s sprinklers are spaced much farther apart so it’s easier to do routine weeding along with irrigating. There are also some cooling benefits from irrigation on a hot day with cool weather crops. And crops like greens and brassicas are hard to germinate in sandy soil without top water. Andy points out the certain crops such as carrots, spinach, beets need water coming from above in order to germinate. Drip lines don’t typically spread the water wide for germination of these crops to occur. Covering 20 acres of their production field, ICF’s main sprinkler and drip irrigation system is a mix of old and new equipment. Over the years, the farm’s investment in irrigation amounts to about $35,000. Given this summer’s particularly dry conditions, irrigation can make the difference between a great harvest and poor harvest for many crops. Our neighbors in the Pioneer Valley, MA are taking a big hit. From crop loss to delaying second plantings, farmers without irrigation systems, are holding out for rain, trying to catch up with laying irrigation lines, and even recruiting more workers and volunteers for hand watering. In response to a UMass Extension survey, 80% of MA farm respondents are losing at least 30% of a specific crop. This data will determine whether USDA’s Farm Service Agency (FSA) in Massachusetts can seek federal disaster assistance. In order to seek a disaster declaration and relief for Massachusetts’s farmers, the Farm Service Agency requires documentation of the extent of crop loss for each county. While climate change in Northeast has meant a trend of warmer and wetter weather, this precipitation is occurring as more extreme episodic events and not necessarily when it’s needed, during the growing season. While five years ago we had record Lake levels and extreme flooding, for the past several summers, we’ve experience extended dry and hot periods in the Champlain Valley. Farms like the Intervale Community Farm that have invested in irrigation systems and planned their system according to crop and soil type are well positioned to have a bumper year. Irrigation has been essential as otherwise we would have lost so many crops as irrigation allows us not only to keep things growing and bulking up, but other crops we can’t even germinate without irrigation so it’s the difference between a crop and no crop. Drought assistance can be found by contacting your County’s FSA office, USDA’s drought program assistance. Information and technical assistance on developing a resilient farming strategy and building soil health in the face of climate change can be found at UVM Extension’s Center for Sustainable Strategy. Normal temperatures at the end of March in Burlinton, VT are typically in the mid 40s like today. Over Easter weekend, it was 16 degrees warmer than normal. With the warmest winter on record, what does this mean for Vermont farmers? Revisiting Tamarack Hollow Farm, I checked in with co-owner Amanda Andrews. How is your new location working out? Our new farm was great last season and held up during the heavy spring rains while our old farm was flooding. That said, heavy rains continue to be a worry, and so we are planning with erosion in mind. To control erosion, we are planting low-growing cover crops between beds, moving towards a permanent raised bed system. We also installed drainage tile in one field with heavier soils to ensure it dries out quickly, even with heavy storms. 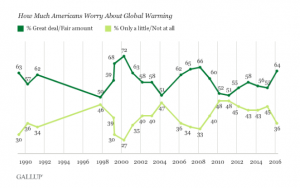 Spring is coming early this year – did we even have winter? How has this affected your plans? Any thoughts on pests and diseases? More than just dirt, our soils are alive. Healthy soil ecosystems, like ones found in nature, are dynamic and complex. Plants, microbes and fungi work together to cycle nutrients, filter water, and regulate the climate. When treated correctly and allowed to function properly, soils can do wonders for the productivity of a farm and the quality of food it produces, and Vermont farmers are starting to take notice. 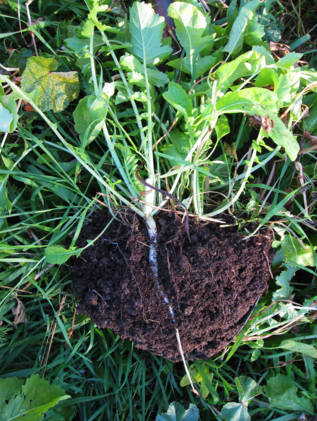 Cover crops show healthy soil where soil and roots are one system. At the 5th annual Vermont Farm to Plate Gathering, farmers, community members and scientists came together to discuss the inseparable link between healthy soils, clean water, and good food. Success stories of higher yields from no-till fields and saving money from using less pesticides and herbicides were shared, showing that paying attention to soil health pays off. Though some soil conservation practices may go against conventional techniques, one thing is clear: the healthiest and most successful farms are taking care of their soils by farming like nature. Plant and soil are one and need each other to function properly. Nature’s time-tested processes have allowed organisms to survive on this planet for billions of years. It’s time for us to use these processes to our advantage, an idea known “biomimicry”. In the natural world, forests and prairies flourish without pesticides or plows. Trees and plants remain year-round, their leaves nourish the soil in the fall and their roots hold water and soil in place when it rains. Come springtime, these ecosystems are teeming with growth and life. Nature knows how to farm. Key-note speaker Ray “The Soils Guy” Archuleta spoke passionately and urgently about farming like nature. (Hear Ray on Across the Fence.) According to Ray, “healthy soil is covered all year round,” just like in nature. Cover crops are the most essential component of restoring and maintaining soil health. Plant and soil are one and need each other to function properly. Plants keep the soil cool and moist, and retain soil structure with their roots. Plants take energy from the sun and feed the microbes, which in exchange pull more nutrients from the soil to the plant. Allowing these natural processes to occur significantly decreases the need to purchase and apply additional chemicals and fertilizers that may runoff and damage local waterways during heavy precipitation events. Healthy soil is covered all year round – just like in nature. When soil is kept in place and macropores are allowed to form, water quality impacts from agricultural runoff and sedimentation are greatly reduced. Soils also play a large role in regulating carbon. Tilling breaks apart the link between plant and soil, releasing carbon into the atmosphere and depriving microorganisms of their food. Soils become starved, and fail to function properly. But when covered with detritus and plants, soils sequester that carbon and use it for growth instead. When Ray Archuleta visits a farm, the first thing he looks for is how the soil in the field compares to soil in the forest. If the soils are healthy, a shovel-full from each should look the same, with a layer of detritus, or organic matter, on top, and soil aggregates clinging to the roots of plants on the bottom. Is your soil bare or covered? Learn more about the secrets in the soil by watching the videos on Ray’s Soil Health Page. Contributor: Michelle Graziosi, the ECO AmeriCorps Water Quality Research Technician at UVM Extension’s Center for Sustainable Agriculture, attended her first Vermont Farm to Plate gathering. Michelle graduated from the University of North Carolina at Chapel Hill in May with a B.S. in Environmental Sciences. The Betz family started High Ledge Farm in 1999. Paul and Kate Betz grow certified organic vegetables on a small parcel of 2.5 acres and manage a 4100 sq. ft. of greenhouses for plant and tomato production. 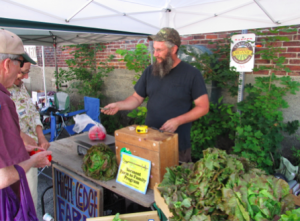 They have a CSA program and sell their produce at the Montpelier Farmers’ Market. The climate change effects, which worry the Betz family, are heavy rain events. These have resulted in soil fines rising to the soil surface and sealing it so that in seedlings have difficulty emerging. The Betz’ have experimented with the timing of their plantings and tried multiple plantings to increase the opportunities for seeds to germinate in these potentially adverse conditions. This past year the Betz family planted their carrots twice because of the risk of soils sealing and preventing sufficient germination. Planting twice meant two opportunities for seeds to germinate. The problem is that any time bare soils are exposed directly to rain with minimal cover to protect them from the impact of raindrops, erosion can occur and soil structure can deteriorate with the possibility of fines rising with the excess water. By minimizing the time that bare soils are exposed directly to rain and keeping soil covered with a crop as much as possible will in turn reduce the possibility of fines and soil surface sealing. The UVM Extension’s Center for Sustainable Agriculture has fact sheet about controlling drainage and increasing the water holding capacity of soils. Rather than take a gamble with weather forecasts to anticpate the possilbity of soil crusting, improving soil composition with organic matter and using winter cover crops to lessen impact of rain will help soils retains more water. Cover crops are a critical part of the soil system as they help support microbial activity which further strengthens soil structure and enhances organic matter in soils. Too much tillage can damage living roots and the soil structure and living roots hence reducing the microbial activity, which makes nutrients available to plants. As Hudson describes in his soil blog, healthy soils have high microbial activity with microbes secreting organic compounds and releasing nutrients in plant-available form. While the effects of climate change include heavy rains with impacts on soils and a longer growing season in Vermont, the temperature variations within the growing season are widening. This risk of a cold snap or heat wave can undermine any perceived benefit of a longer growing season. Recognizing the variability and extremes of Vermont weather, farmers have turned to greenhouses and hoop houses in growing numbers. Their strategies for coping with variable weather start from the ground up. Maintaining and improving soil quality is essential with additions of organic matter, cover cropping, and minimizing tillage. Soils which have more plant matter including living roots in the soil and leaves on the soil have increased microbes which help retain more moisture during dry spells and can cope with absorbing more rainfall during wet periods. While soils with higher organic matter content can help mitigate wider ranges in precipitation, greenhouses help mitigate wider ranges in temperature. 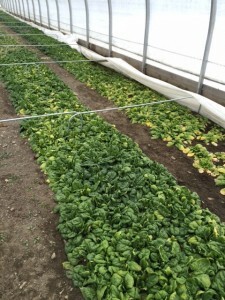 Using a greenhouse to control the environment, the Betz family benefits at both the start and the end of the growing season so that the swings in temperatures during Vermont’s shoulder seasons of spring and fall don’t result in swings in income.